/By Justin Vest/ The first time I tried to make a living on minimum wage, I was shocked. Where did all my money go? It wasn't the first time I had earned minimum wage. I had a summer job at a state park throughout high school, had campus jobs and worked retail in college. But I grew up in a middle class home and my poor college experience mostly just limited my social activities. But suddenly, half my income was going to pay rent plus more for bills. Whatever measly amount was left would go towards those things you can't buy with food stamps: diapers for the baby, laundry detergent, toilet paper. Living on minimum wage makes it impossible to really participate in a world where everything costs money and even the cost of a cup of coffee can be prohibitive. When the Fight For 15 began in the Fall of 2012, it immediately resonated with millions of low-wage workers who took to the streets with a simple message: we are worth more. It's not about the type of work that we do because we all have to live in this world where essential goods and services are simply out of reach for anyone below a certain income threshold. And with the federal minimum wage stuck at the artificially low rate of $7.25/hour, states are left with a very low bar for progress when it comes to raising wages for their lowest paid workers. Maryland's minimum wage will increase to $8.75 on July 1st. Montgomery County's minimum will go up to $10.75 in July as will Prince George's in October. But access to affordable housing, childcare, and healthy food are still issues for minimum wage workers. In one of the country's most expensive regions, workers don't just deserve a raise, they need one to survive. Fortunately, both Baltimore and Montgomery County (as well as DC) are pursuing a $15 minimum wage. In Montgomery County, though, there's just one exception. Tipped workers aren't included in the bill and would be stuck at the current subminimum wage of only $4/hour! Tipping is an antiquated system originating in feudal Europe, but introduced in America as a way for employers to avoid paying newly freed slaves. Today, 65%-70% of tipped workers are women, primarily women of color, working in casual dining establishments. Their low pay–legal pay inequity–is often only enough to cover taxes, so they are completely dependent on customer tips. As a result, 90% report experiencing some form of sexual harassment from customers and even supervisors who may encourage servers to sexualize their behavior to increase tips. This reduces the employers financial burden, but it also puts workers at risk. As if this weren't bad enough, wage theft -- employers cheating on paychecks, deductions and hours -- has been documented at rates over 80% nationally! All workers deserve a raise. The Fight For 15 is a worthy fight, but only if it includes the 6 million workers who are currently excluded from the regular minimum wage. 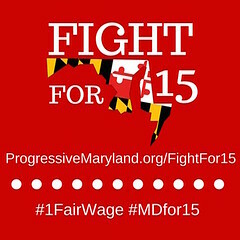 In Maryland, there are 100,000 tipped workers earning the subminimum wage of $4/hour. Forty percent have children and are at the mercy of customers' good will, arbitrary scheduling, and even the weather to be able to provide for their families. The good news is we have a chance to change this inequitable structure. Show your support for raising the minimum wage in Montgomery County to $15/hour and making it one fair wage for tipped and non-tipped workers by signing this petition. Join the movement because we are worth more.